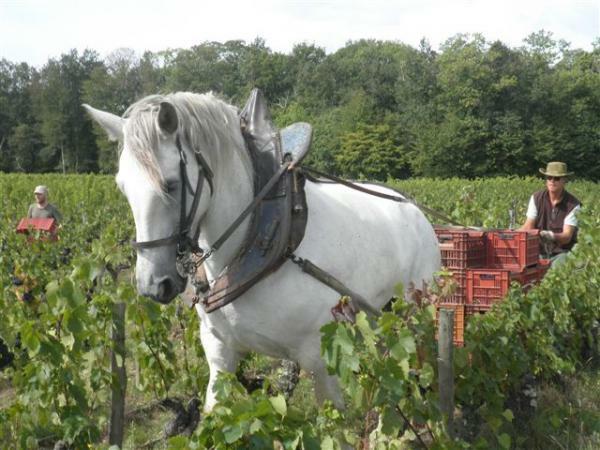 We are a viticultural estate composed of 8 hectares in the area of the Touraine A.O.C. Our soil is principally composed of clay and limestone, and cultivated in biodynamics. We work with low yields to obtain more concentration in the grapes. We spend a lot of time observing the vines, the soil and its' surrounding environment. We work the soil with a horse, and we do not use any chemical products. We use a calendar indicating the position of the planets, which influences our decisions on how and when to work with the vines and the wines, when to add compost to the soil and when to apply biodynamic herbal preparations. We live in Pouillé, a small village on the edge of the cher (loir et cher), between Tours and Vierzon. We recommend opening the wines a little before consumption. The air will "inspire" the wines to be more interesting. In fact, if you wait a few hours, some lovely surprises await you! Like any living product, a minimum of attention is required in handling the wine. Don't leave your bottles in cars and exposed to high heat. Keep them in a cooler atmosphere and unexposed to light. If possible, keep the wine in a fresh cellar with little to no temperature variation. WHY SO MUCH EMPHASIS ON AGING THE WINE? Zero chaptalisation: We don't add sugar to the wine, and we therefore need to have low yields so that the sugars are naturally present in the grapes. No yeasting or enzymes: these are techniques used to accelerate vinification, and in some cases to avoid that the grape juice "deviate" in any way. No sulfur or conservatives: If the vintage allows it. Aging our wines permits us to do all this. We have not produced an A.O.C wine since 2002 because we disagree with the current state of the system. The jury are composed in majority of viticulturists who yeast and heavily sulfur their wines. Our wines are such a stark contrast compared to what our colleagues produce that we would never be given the A.O.C with the wines we choose to make. While we remain hopeful that the A.O.C system will improve, in its' current context our wines have no place in it. But by staying true to our ideas and to our customers who were able to bring us confidence and support in our choices, we continue to make wine our way, under the Vin De France designation. WHY CROWN CAPSULES INSTEAD OF CORKS? For many years, we struggled with a cork's effect on wine as well as the ecological implications of the over-exploitation of oak trees. So today we bottle our wines with a stainless steel, recyclable crown cap that we feel preserves the wines' true nature. It is proven that corks (mostly because of how they are washed and treated in production) alter the purity of a wine's aromas. While this might be hard to distinguish on its' own, it would prove evident if you tried a corked bottle of our wine next to a crown capped one. Furthermore, a study on corkage in Bordeaux held 30 years ago proved that the maturation of a wine in bottle is not caused by the exchange of oxygen through the cork, but rather the oxygen already present when the wine was bottled. The caps we use are the very same vignerons have been using for generations in Champagne while the wine is aging sur lattes, and can let a wine age up to 15 years. Synthetic corks and glass caps where also considered, but ultimately passed on since they work better with wines that are meant to be drank young.